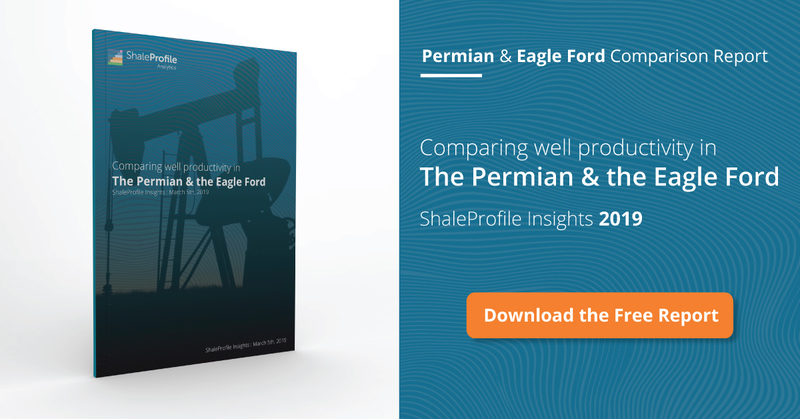 With good well production data available now until June, we can have a look at how US shale has been doing in the first half of this year. This interactive presentation covers the oil & gas production from 64764 horizontal wells in the 8 states that I currently cover (TX, ND, NM, CO, WY, MT, PA, OH), all of which have started production. Wyoming has been added since the last US update. Total production from these wells reached 5.6 Gbo, while cumulative gas production topped 46 TCF. Total oil production, after peaking March 2015, is now back at levels close to 2 years earlier, in the summer of 2014. High activity levels in 2015 were able to hold production quite steady, but in 2016, until June, only about 60% of the legacy decline (740 kbo vs 1200 kbo) was replaced with new production. Still, this is a large number, given that completion levels were less than half compared with the year before. Wells, on average, increasingly deliver more of their eventual returns early on. This can be clearly seen in the “Well quality” tab, by the higher early peaks in recent years, followed by steeper declines. This higher initial productivity is an important factor behind the previous bullet point. For a somewhat fairer comparison, you can exclude the “Appalachia” and “Other” basins, which contain a high proportion of gas wells. The number of wells are labelled as spud, but not producing, has been reduced since early 2015 by about 25%. You can see this in the “Well status” tab, if you select the status “2. DUC”. This excludes Texas, for which I don’t have this data. Note that in these findings I have ignored gas production. However, the presentation includes both oil & gas wells, so for a better picture, both products should be taken into account. I introduced a way to also see the well profiles of individual wells. In the “Well quality” tab, you can now select the “Show wells by” option “Well”, to see individual wells. Make sure you do this after using the filters to narrow down your selection, to improve the performance of the presentation, and to get a sensible result. Next week Thursday (October 13th), I plan another update on North Dakota. I wanted to run something past you and the wider community of experts that visit here in relation to natural gas production. Superimposing rig count and production at four of the major shale gas fields, it’s uncanny how a bump or dip in rigs shows up in the production curve after a certain lag, with a very identifiable profile (please see attached). I would have expected macro, project and market variables to blur that relationship much more than seems to be the case. So the question is whether the rig count forward indicator (“RCFI”) is really that accurate, with very specific patterns in the rig count then repeated in production after a certain lag? – Haynesville production will continue a slight decline. – EF has a little more of its steep decline phase to work through before it stabilizes to a gradual decline. – Utica should experience a noticeable drop in production. Anyway, I throw that out there and look forward to comments. I have not looked closely at this before, so maybe others can chime in. I have looked in the past to the relationship between rig counts, and oil production, especially in ND. My impression is that rig counts are a very important factor in long-term production, but the link with short-term production is very fuzzy. The reason is that changing rig efficiency, building/depletion of the DUC inventory, and changing new well productivity, all have major effects as well. I therefore recommend that any view on this also takes these factors explicitly into account. Looking at your graphs, I would be wary to try to relate small changes in the rig count to certain changes in the production numbers after some time. There probably is some relation, but I think our own ingrained pattern-recognition software may sometimes fool us here. But, as I said, I haven’t done any real work on this.